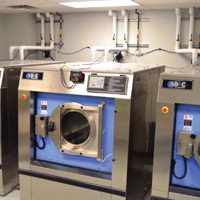 Nobody in the mid-South offers a better selection of commercial and industrial laundry equipment than Justin Laundry Systems. We offer industry leading brands such as B&C, Wascomat, ADC, Electrolux, Primus, Maytag, HM, Hamilton Engineering and many others. We’ll be more than happy to compare our brands and services to any other distributor. We also with FREE on-site surveys and will custom design any laundry project you may require for bid process or purchase. “I shopped around for my laundry equipment before finally making the perfect laundry decision by choosing Justin Laundry Systems. They offered reputable brands, expert service and went the extra mile to assist me by showing comparisons of all the brands I was looking at! I am very impressed with the customer service from Justin Laundry Systems.